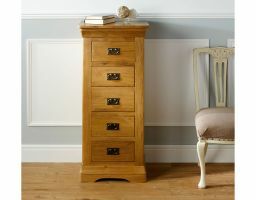 The stunning Farmhouse Country Oak 5 drawer chest of drawers / tallboy exclusive to Top Furniture. Classic French Farmhouse styling. Delivered FULLY ASSEMBLED. Hand made using traditional joinery techniques and with strong dovetail joints on all drawers. 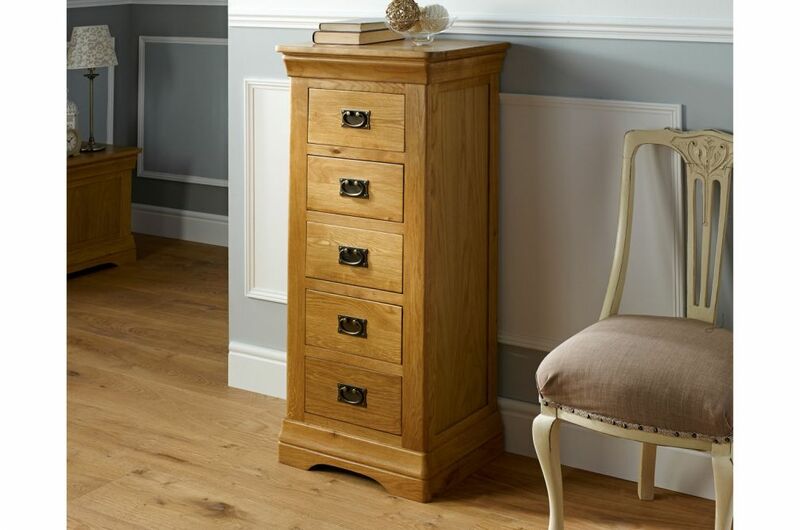 A hard wearing oiled wax finish is applied to this item of bedroom furniture which also shows off the beauty and grain of the sustainable American oak. 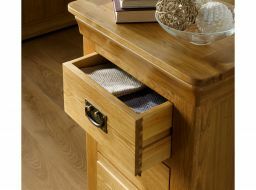 You get a huge amount of drawer space with this chest along with the other sizes of Farmhouse oak chest of drawers. Dimensions: W 530 x D 410 x H 1175 (mm) - Available to view in our Uttoxeter, Staffordshire and Dartford, Kent shops. The tallboy is well made and looks good next one of the bedside tables from the same range. We have many pieces of Farmhouse Country Oak around our home and are extremely pleased with all of them. Fair build quality, and great for the price. Looks great! Fantastic quality - second purchase from Top Furniture - great friendly delivery service. Well made and good looking furniture. It arrived very well packaged and the delivery was efficient and drivers polite and courteous to my elderly mother. Very pleased and would certainly buy from you again. Very nice piece of furniture . The delivery men were polite and helpful calling me 20 mins before delivering . We are very pleased with the quality of this piece of furniture as with the 4 other pieces which we also purchased from Top's. They are well made and the beauty of the wood is unquestionable. One minor observation is that the handles are a bit noisy if there is any vibration from the floorboards even if the floor is carpeted. Looked around for a long time to find a unit that looked the part. This does and exudes quality.. well made and competitively priced and looks great in the bedroom.